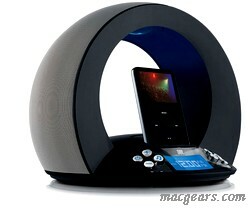 iPod Docks – Free your tunes? Recently a couple of my close friends got themselves a brand new iPod each, a 160gb Video and an 8gb Valentines Day pink Nano. Two new iPod speaker docks emerged a couple of weeks later, a JBL top of the range model and a cheap and cheerful model from HMV. The majority of the time I use my iPod is through my Amplifier and speakers making the usability of the iPod the same as on the move, speaker docks weren’t as widely available when I got my 3rd generation. Anyway I brought my iPod together with the JBL dock and was faced with the task of finding the right dock inset to fit my ‘old’ iPod into the dock. The dock came with 7-10 different pieces of plastic for each iPod to fit into it – accept 3rd generation and older iPods. I thought, no matter, i’ll plug it in via the aux-in socket and cable provided, but the cable head didn’t fit in the gap in the casing before the socket itself. Eventually I discovered the 5th generation piece of plastic fitted my iPod and everything worked fine, but I find myself asking why this dock made specifically for iPod doesn’t fit all iPod’s, whats the point? I recently have been in the Lake District and the log cabin we hired up there had a small stereo with ‘USB integration’ When we plugged an iPod in the standard I’ve-been-plugged-in screen appeared on the iPod ‘Do not disconnect’ rendering the controls for the iPod useless. The stereo recognized a device and decided to completely ignore ID3 tags and play all the 01 tracks on the iPod, then all the 02 tracks etc. This meant it was impossible to listen to an album in order, not to mention see what artist/album/track you were playing. So my question is what was wrong with the standard we had pre-iPod? Aux-in and RCA cables never fail, you have full control over what your playing and all you need is a cheap cable. But going back to speaker docks, I can sort of see the point of them for rooms like the kitchen where your hi-fi can’t be heard, but a cheap stereo with an aux-in socket, a radio and a CD player gives you much more musical options than an expensive iPod speaker dock.